Free Motion + MSM - a combination of Glucoseamine and Chondroitin Sulphate in high concentrations, with added vitamin C and Manganese, which are essential for maintaining a normal and complete structure of the cartilage tissue. The formula is enriched with MSM for relieving pains stemming from muscle and skeleton inflammations. MSM provides significant, prolonged relief from pain, stiffness, swelling and additional osteoarthritis symptoms. This formula assists the treatment of cartilage erosion by strengthening the restoration mechanisms which are at work in the tissues of damaged joints. Nutrients in this formula delay cartilage erosion, prevent inflammation conditions, reduce pain and promote a restoration process of the connective tissues and cartilage in the joints. Promotes the generation of connective tissue and cartilage, and responsible for the proper functioning and the regeneration of joints. Prolonged use will reduce joint inflammation symptoms and will stop the disease's deterioration process. An ingredient with importance for cartilage, tendon and ligament structure. Promotes tissue generation, improves joint functioning and reduces pains accompanying inflammation. Organic Sulphur which serves as an especially effective analgesic in conditions of muscle and skeleton inflammations, such as arthritis and osteoarthritis. 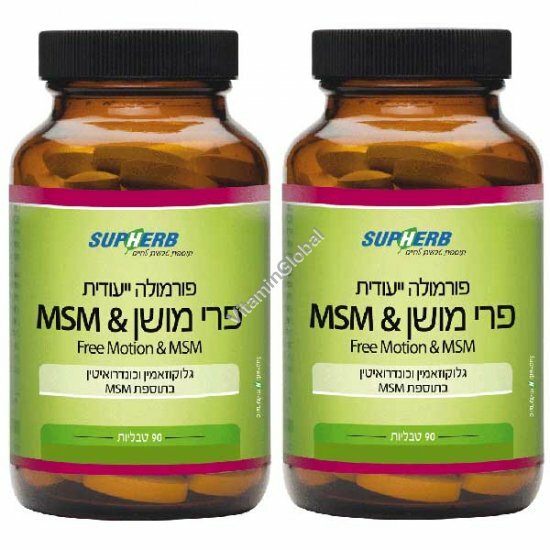 MSM provides significant, prolonged relief from pain, stiffness, swelling and additional symptoms related to inflammation of the joints. Available in packages of 180+30 tablets.